Dancing in "Sol LeWitt's Expanding Grid"
In the late ’70s, Sol LeWitt was invited by choreographer Lucinda Childs and composer Philip Glass to collaborate on what would become a landmark work, Dance (presented at the Walker April 7 – 9). In “Sol LeWitt’s Expanding Grid,” critic Ann-Sargent Wooster wrote about how the artist’s film-as-set design for Dance was “a radical and innovative departure from his previous work”; her essay — excerpted here — was published in the May 1980 issue of Art in America after Dance‘s 1979 premiere. It is also anthologized in Sol LeWitt Critical Texts (I Libri di AEIOU and Incontri Internazionali d’Arte, 1995). Click here for an interview with Lucinda Childs; Sol LeWitt: 2D+3D is on view in the Friedman Gallery through April 24. Dance by Lucinda Childs, Philip Glass and Sol LeWitt, performed at the Brooklyn Academy of Music in December 1979, will take its place in the history of spectacular music-dance-art collaborations that includes Parade (1917), and in itself was a precedent-setting event. The collaboration was unusual because it brought together three individual who since the ‘60s have been working with similar modular structures in their separate disciplines. Though the production turned out to be a synergistic combination for all three collaborators, it was especially significant for LeWitt, whose contribution of a film was a radical and innovative departure from his previous work and has profound implications for his future development. LeWitt’s black and white film (codirected with Lisa Rinzler) recorded Childs and her company in a studio performing dances that they had previously presented on tour and would later execute on the BAM’s stage. 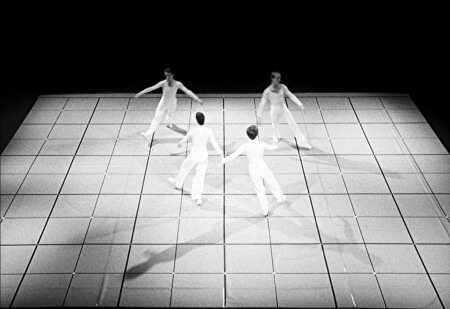 Because of financial considerations, the LeWitt film accompanied only three of the production’s five dances, which are titled Dance 1 through Dance 5. During those three segments, Glass’s music, which was prerecorded to fit the film, took a back seat to the work of his other two partners. When it was performed live in Dance 5, however, the music erupted in full force and dominated the proceedings. Characteristic of this production (and in contrast to the discontinuity which characterizes the collaborations between Cunningham and Cage, Tudor, et al.) was the fact that its three parts – film, dance and music – were designed to synchronize with each other. LeWitt’s film, which introduced a grid as the setting for Childs and her company, was projected on a scrim covering the front of the stage. Though the filmed and the live dances were synchronized, they seemed at times to be two different activities, each evoking radically different sensations. The great discrepancy in scale between the film and the actual dance was primarily responsible. Since the filmed dancers appeared ten times larger than the actual ones, the film had considerably greater presence than the comparatively Lilliputian live performance. Indeed, the actual dancers seemed less real than their photographic images. The dissimilarities in scale coupled with differences in the way each was lit made the combined film and performance resemble a synthesized video tape in which disparate events are conflated. The film on the surface of the scrim itself created an image not unlike a giant television screen. 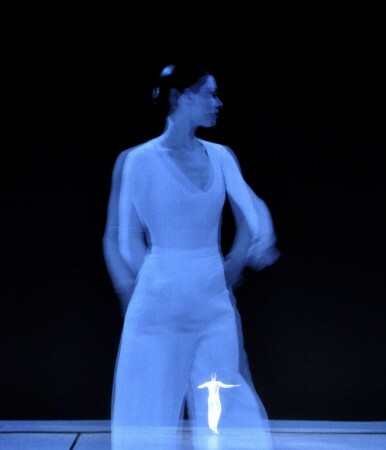 And in Dance 1, the blue lighting – the color of TV screens seen through windows as dusk – heightened that similarity. The presence of the grid substantially changed the appearance and the meaning of Childs’s dances. Though Childs has used geometric configurations as the basis of her choreography in the past, the existence of those structures – straight lines, triangles, arcs – often had to be intuited. When her dances were placed on a grid in the filmed segments of Dance, however, their mathematical foundation became immediately evident. The combination of dancers and grid had exactly the opposite effect for LeWitt’s work: the figures served to humanize it. In the visual arts the inclusion of figures within a grid has been relatively rare. The closest parallel to Dance is Joseph Cornell’s cover design for the March 1942 issue of Dance Index, in which frames from a print of a 1905 film of Loie Fuller dancing are arranged as a grid. For LeWitt, the placement of figures in/on the grid stresses the underlying physical/anthropomorphic quality of his own structures. The figures remind one that his honeycomb sculptures are often built to human scale and that his wall drawings rely on human decision-making and execution. Of the three dances that incorporated LeWitt’s film, Dance 3 was the most exciting for its suggestions of possible future uses of the grid. 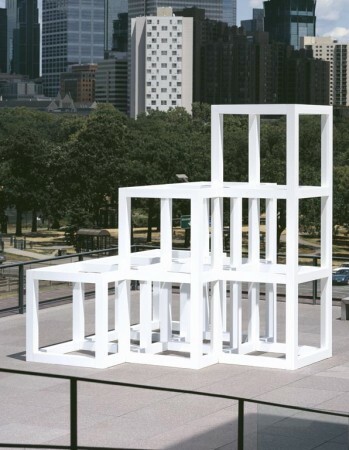 Employing split-frame images set at different angles to the stage, LeWitt created the illusion of a latticed cube seen in perspective. The dancers thus appeared to be dancing both within and on top of one of LeWitt’s own sculptural grids, their movements transformed into a three-dimensional tic-tac-toe. They, in turn, completely revolutionized the meaning of the grid – changing its usual abstract, symbolic character to the more functional role of a high-tech piece of furniture. Together, the figures and grid seemed absorbed into the realm of painterly, illusionistic space and the move in some dimension beyond the reality of the stage on which we know they danced. LeWitt’s film also had a metamorphic effect on Childs’s solo in Dance 4. When in the fall of 1978 Childs performed a version of this dance in the smaller, more intimate space of the Kitchen, it appeared to be about her control of an electrical current as it passed through her body and was transformed into movement. Unlike most dances, the movements of this one were limited almost exclusively to the upper torso, with Childs using her arms as if they were propellers. On the large stage in Brooklyn, all the dances and dancers were dwarfed, and small movements became invisible. That miniaturization was not a great problem for those parts of the performance in which all-over, particulate movement is designed to be seen at a distance and the dancers are meant to resemble atoms ricocheting off each other. Abstraction and depersonalization are, however, less satisfactory for those solos in which movement is more condensed. In such solos, the body’s role as a physical conveyor of meaning is of key importance and even the tension in the muscles of the chest must be visible. In Brooklyn, LeWitt’s film functioned as a simultaneous commentary on Childs’s solo, heightening the effect of the dance. When Childs’s movements were frozen in the film, they achieved monumental stillness and immediacy, an intensity that was diffused in the live dance by the space of the large stage. LeWitt’s film provided the type of close-up we normally associate with instant replay in sports coverage and had a similar effect: it concentrated our attention. It also had another more important effect: it conferred iconic status on a figure that might otherwise have seemed to be performing the merely personal activity of charting space with her body. In the context of its filmed doppelgänger, the live dance was expanded and transformed. Seen both singly and stereoscopically, Childs dominated the stage so thoroughly that her solo became a wholly different kind of activity than it was in its earlier version. In a recent article on grids, Rosalind Krauss has noted that the “grid announces modern art’s will to silence, its hostility to literature, to narrative, to discourse.” <1> She has suggested that its adoption by artists such as Mondrian and Albers tends to be a terminal posture and that “one of the most modernist things about it is its capacity to serve as a paradigm or model for the anti-developmental, the anti-narrative, the anti-historical.” <2> In both his dance film and in his recent books of photographs, LeWitt has invented a way to sidestep the trap the that grid represents. The art of the late ‘70s (and perhaps the ’80s as well) could be characterized as embracing the personal, the subjective and the narrative. By incorporating those qualities into his grids, LeWitt has found a way to revitalize structures that had seemed impervious to change and that had previously been identified only with an impersonal, objective art.